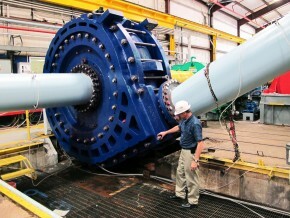 GIW’s Super Pump houses a massive 84-inch impeller. Willis has seen countless examples of how GIW’s over-the-top, hands-on customer service model has saved customers time, money, and headaches. One customer in the phosphate industry was breaking pumps on startup on a long-distance pumping system with multiple pumps in a series. After a site visit, GIW employees realized the customer’s system startup procedures — which consisted of starting the system in the correct sequence but too fast — was creating excessive pressure on the last pump in the line. Instead of just trying to sell more pumps or parts, GIW employees convinced them to slow down the startup procedure to reduce the pressure in the pipeline and eliminate the pump failures. That’s what customer service means to Willis: It’s an ongoing relationship that requires education, continual improvement, and innovative research to stay ahead in a field that is always changing. Take wear life, for example: Wear is a constant problem for most customers in extreme conditions. In oil sands, one customer had an application where average wear life for pump wear parts was about 1,500 hours. But Willis recalls this particular oil sands customer issued a challenge to GIW: This client wanted a minimum of 4,000 hours — with an ultimate goal of 6,000! GIW employees designed, manufactured, and performance tested the company’s largest Hydro Transport pump in its Grovetown facility for this customer — a TBC84 pump that houses a massive 84-inch impeller, which is significantly larger than the customer’s original TBC 57 pump. This bigger pump is able to run at slower speeds and gets the same or better throughput, but with a great reduction in wear. At GIW, we don’t see our customers as just customers; instead, we view them as partners. That means we’re here to continually help them explore and realize their long- and short-term returns by using our products, which, in turn, helps our business as well. This commitment to the customer isn’t going to change anytime soon. And with any luck, it’ll help ensure our mutual success long into the future.